You'll be £14.99 closer to your next £10.00 credit when you purchase Crimes and Criminals of 17th Century Britain. What's this? Order within the next 2 hours, 23 minutes to get your order processed the next working day! Who was the murderer who committed an atrocity at an East End brothel in 1691? And was he ever caught? What superstitions lay behind the unfathomable slaughter of three innocent children at a remote farmhouse in County Durham in 1683? When was a parish constable murdered in cold blood by a party of men that allegedly included the illegitimate son of King Charles II? Where did violent, lethal confrontations occur between supporters and opponents of King James II during the so-called Bloodless Revolution of 1688? Why was Dr Clenche ruthlessly garrotted in the back of a coach meandering through the darkened London streets? How did the very first killing attributed to the nation’s civil wars occur in Manchester? Is there any truth in the legend of Exmoor’s lawless Doone clan? These cases, and many more, are explored in depth within this work, and harken back to a time of witchcraft purges, duelling and political assassinations, when the punishment for killing one’s fellow man was either more barbaric than the crime itself, or corruptly lenient. Within these pages the story of violent crime in 17th century Britain is told, from sociopathic noblemen and ruthless bandits, to war crimes and judicial assassinations. 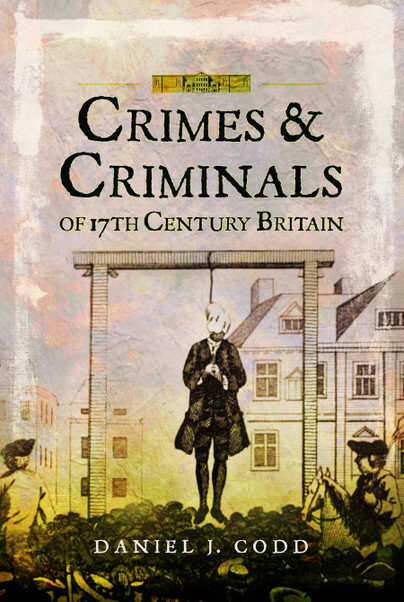 Illustrated throughout and shedding a unique light on the era, Crimes and Criminals of 17th Century Britain is the first work of its kind to explore the monstrous murders that occurred against the backdrop of a nation that repeatedly imploded. Codd has done his homework and displays an eye for detail and a passion for finding lost stories. The book is arranged by type of offence, from early serial killers to war crimes, highway robbery, riots, and gentlemen who squared off in duels, giving this the feel of a reference work. The onslaught of names, dates, and gruesome crimes can be overwhelming but is certain to make readers grateful for constitutional rights and the rule of law. 17th-century Britain was an extremely lawless place. All Europe was lawless. Some historians attribute this to climate change (‘The Little Ice Age’), others to over-population. Warfare was rife, both organised and informal; political and religious killings, witch-hunts, piracy and banditry abounded; duelling was an accepted form of legalised murder and almost all males carried weapons. This book is therefore more than a record of individual crimes and lawful punishment. There are chapters on duelling, bandits and highwaymen, piracy and coastal raids, riots and disorders, clan warfare in Scotland, war crimes and judicial crimes (legalised murder of political enemies). It is surprising that ‘ordinary’ crimes received any attention or that normal judicial processes were observed. But they were and gradually the country developed into a tolerant, law abiding society. It was a long road. Daniel J Codd has spent years delving into history, criminology, folklore, antiquities and the supernatural in Britain. He has previously written a number of published books on these very themes, as well as magazine articles. His research is driven by a belief that truth is often far more interesting than fiction and there is always a new story to discover.